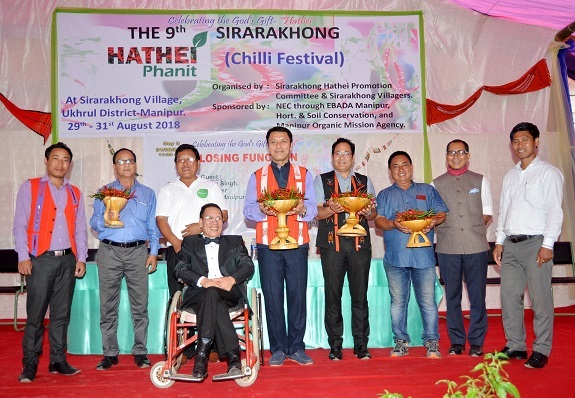 The three-day long Sirarakhong chilli festival locally known asHathei Phanitcame to its end at the picturesque hilly village in Manipur’s Ukhrul districton Friday. The festival held under the theme “God’s Gift-Hathei” at Sirarakhong village, about 67 km north of Imphal was organized by the Sirarakhong Hathei Phanit Promotion Committee & Sirarakhong Villagers. It was sponsored by North Eastern Council through Eastern Border Area Development Authority Manipur, Horticulture and Soil Conservation and Manipur Organic Mission Agency (MOMA). Speaking on the occasion Manipur Education, Labour & Employment Minister Thokchom Radheshyam said Hathei which grows only in the Sirarakhong village is a beautiful gift of god that signifies the village. “Every individual gathered here is all because of Hathei (chilli),” he said adding the festival gives the villagers a chance to meet and connect with the people from different parts of the state and even from around the world. The minister also visited the stalls displaying green and dry chillis available in the village. According to state horticulture department officials, there are around 8 chilli varieties in the state. Highlighting the importance of Geo tagging, MOMA project director K Debadutta Sharma informed that the initiative to Geotag, theHathei(chilli) has already been taken up by the department of horticulture & soil conservation, Manipur. He said once it is done it will enable to find information related to theHatheiin the internet with the geographical indication mentioning theHathei’s originating place, Sirarakhong. On Thursday, Indian Council of Agricultural Research Manipur centre under its tribal sub-plan scheme considering its requirement in the village handed over a small processing unit which can speed up drying of a minimum of 100 kg of chilli on daily basis. The processing unit costing around Rs 9.5 lakh includes a grinder, a dryer, sealer, sieve and weighing machines.